You can already charge your electric vehicle in several Schiphol office car parks. At The Outlook we go a step further from 25 March with the introduction of bidirectional charging. A smart form of energy management, whereby both car and building can supply the other with energy! Alongside its forty conventional EV charging points, The Outlook now has two bidirectional ones. Combined with dynamic load balancing, these not only allow us to cushion the building’s peak consumption moments but also to balance the distribution of power to cars and offices in an efficient manner. The smart bidirectional technology constantly allocates available energy between them in the most effective way. At times of high consumption, the building balances distribution rather than simply increasing its drain on the regular power grid. This both cuts costs and eases the burden on the environment. The energy consumption of an office building peaks at various times of day, when occupancy is at its highest and people are using its facilities most intensively. For example, once the kitchen closes after lunch, consumption decreases sharply and you suddenly have spare capacity available to use elsewhere. Based on historical data, we can predict when those peak moments will be and what level of consumption they are likely to bring. If there are EVs plugged into charging points in the car park at those times, then we can help meet the building’s demand by drawing on their batteries. But as an EV driver, does that not mean that you risk finding your battery empty when you want to use your car? Not at all, because the system tells us how many vehicles are charging at any given moment and because we know – again from registered data – what time you are planning to leave the building. So the smart technology ensures that your car is ready for you when you need it. One additional benefit of a system combining bidirectional charging points with dynamic load balancing is that it distributes energy better, thus meeting demand from all users more efficiently. For example, we are now able to operate 42 charging points from a system really designed to feed only seventeen. Because not all their batteries need to be charged at the same time, we spread the available power over the connected cars in such a way as to make optimum use of the system’s capacity and so enable it to power up more vehicles. 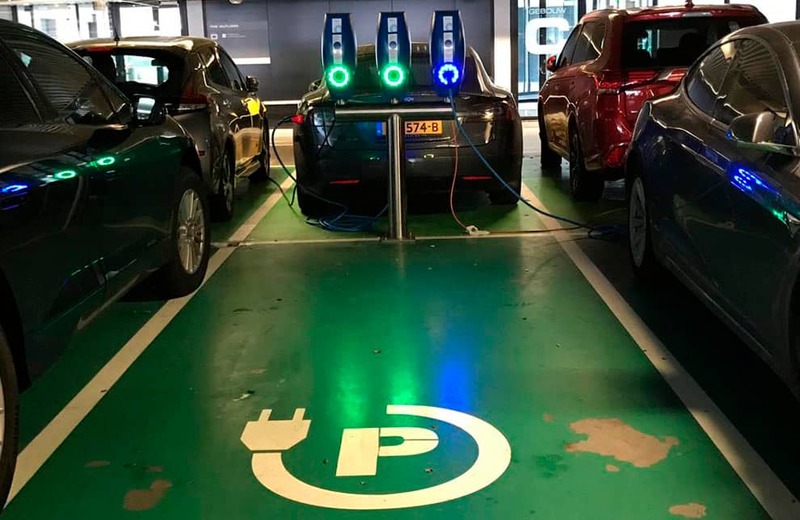 Schiphol Real Estate has managed to install the smart bidirectional charging points without the need for radical adjustments to the infrastructure at The Outlook, such as fitting additional electrical systems. This has substantially mitigated the project’s costs: with an energy consumption of 22 kilowatts per unit, the installation of EV charging points normally requires considerable investment. It is thanks to the combination with dynamic load balancing that we have not had to overhaul the infrastructure, thus implementing bidirectional charging in a cost-effective manner. The new charging points at The Outlook entered service on 25 March 2019. The “game” of power sharing between vehicles and building then began. We will be closely monitoring how our plans to cushion peak office consumption work out in practice, in combination with the EVs’ demand for power, to see what the system actually delivers and how much we really save. Once the results are known, you can read all about them here. The introduction of smart bidirectional charging at The Outlook is a joint project with ENGIE Services. Technical service provider and energy company ENGIE is committed to sustainable change in the sector. Together we hope to bring smart charging to the next level. Our business parks at Schiphol are evolving all the time. Whether it is bidirectional charging, smart office buildings fitted with sensors or the rollout of the roadmap to our sustainability objectives, we are working step by step to create Schiphol Smart AirportCity. Want to find out more about renting space at Schiphol?